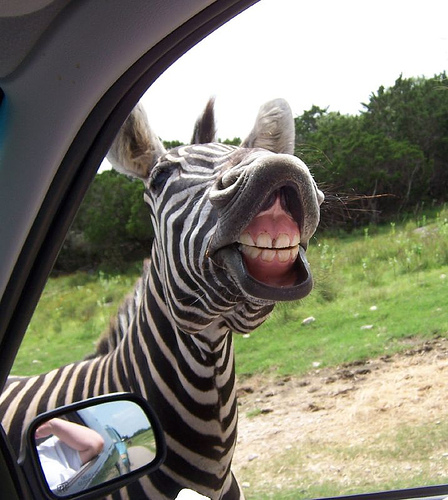 When you hear hoofbeats, don’t think zebras. | Marketing…pfft! When you hear hoofbeats, don’t think zebras. “When you hear hoofbeats, don’t think zebras. So I did what any dumb marketing guy would do. I went to Wikipedia. Turns out the adage was first coined by Dr. Theodore Woodward in 1940. Dr. Woodward (or just Doc, as I like to imagine they called all doctors in the 1940s), used it to describe a very simple, yet fundamental principle in medicine. If you hear hooves behind you, don’t expect to see a zebra when you turn around. Chances are it’s a horse. In other words, look for the simplest, most common explanation to a problem first. Only when that’s ruled out should you look for rarer, more complicated explanations. The medical term for this is differential diagnosis. So if you ever find yourself laying in a hospital bed among a team of doctors talking about horses and zebras, don’t get excited. They’re not bringing you an exotic pet. Research has shown that our brains are actually wired to fight against the simplest explanation. The ‘striking and the novel stay longer in the mind’ is a well-known phenomenon, first cited in Rhetorica ad Herennium, circa 85 BC. So if you’re in NY and see a pigeon, you probably won’t remember it. But if you see a gang of drunk clowns stumbling down 5th Avenue at 10 AM on a weekday, you’re more likely to retain that information. Incidentally, this actually happened to me. Second, there’s the availability heuristic, which is a bias to assign more importance to something you can think of. If you can think of it, it must be important. Because you’re so important. Or at least you think you are. Put another way, events more easily remembered are interpreted as more probable. It’s very simple, but incredibly important that this be drilled into the heads of medical students early. Because looking for zebras is very dangerous. At best it’ll delay treatment. Worst case you’ll be treated for the wrong thing, and what’s really going on will kill you. While those of us in marketing don’t typically deal in issues of life and death, I couldn’t help but relate this concept of horses and zebras to problems I’ve encountered in my own work. Whether your ‘patient’ is a demand generation campaign that’s not producing results, a website that’s not converting as many buyers as you’d like, or a new corporate blog that’s not getting much traffic, the range of diagnoses are pretty clear. At the highest level, it’s either what you’re selling (offer), who you’re selling it to (audience), or how you’re selling it (creative, or more broadly, execution). The trick is to tell the difference between the horses and zebras that could be bringing down your performance. Could the problem be that you chose a black and white photo instead of a color one for your landing page? Maybe, but that’s not where to look first. Did you target the right people? Does your offer stink? Those are your horses. Don’t spend your time theorizing about the correct shade of blue for your banner ad until you’ve ruled those out. Granted, that’s a simplistic example using the principle of the 40/40/20 rule to illustrate my point. It’s arguable that these days, how you communicate the message (creative) is much more important with the rise of social, mobile, and changing habits in how people consume content. I’ll cover my views on how the 40/40/20 rule is evolving in a later post. But for now, suffice to say that horses and zebras will be dictated by the symptoms your marketing effort is experiencing and can vary by any number of circumstances, as they often do in medicine. So whether you’re tackling a marketing or general business problem, remember this clear lesson from the people we trust our lives with. And knowing that we’re wired to give undue weight to relatively improbable explanations will also help keep you in check. Put another way, KISS (Keep it Simple, Stupid). But remember, just because it’s simple doesn’t mean it’s easy.